Learn as much as possible about yourself, your future mate, and Gods purpose for marriage before you tie the knot! You will find godly guidance about choosing a life partner, assessing readiness for marriage, and entering a lifetime commitment with confidence and joy. June Hunt, a licensed biblical counselor, explains the biblical requirements for marriage and describes the relationship Red Flags to avoid. Take the True Love test and use the checklist for choosing a mate before entering into marriage. Discover Gods design for the marriage partnership as well as how to develop healthy expectations and wisdom about whom you let into your heart. A vibrant, healthy marriage is possiblebut getting ready for life together starts long before the honeymoon! Paperback, 96 pages, 4 x 7 inches. Considering Marriage by Hunt, June was published by Rose Publishing in May 2017 and is our 36540th best seller. The ISBN for Considering Marriage is 9781596366763. 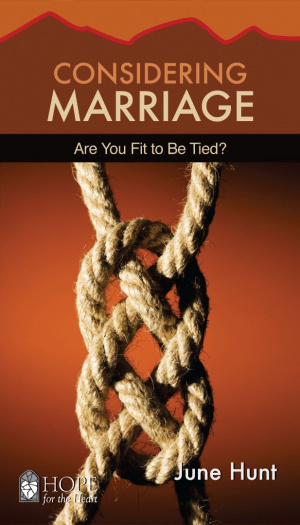 Be the first to review Considering Marriage! Got a question? No problem! Just click here to ask us about Considering Marriage.